But beyond the destruction of the fabric of relations between Jews and Arabs, and beyond the act of penetration and takeover of Arab neighborhoods, the measures in Sheikh Jarrah put Israel into a considerable legal, political and historic bind: if Jews can sue Arabs for ownership of property before 1948, what will prevent Arabs, who own hundreds if not thousands of properties in West Jerusalem, to claim their ownership of them? What will stop them from demanding the eviction of thousands of tenants from properties that were owned by Arabs in Talbiya, Baka, German Colony, Talpiot, Abu Tor and other neighborhoods? In all of those neighborhoods, and not only in them, Jews live in houses that once belonged to Arabs. Is it really in Israel’s interest to open up the discussion of historic rights to property from before 1948? The reopening of 1948 is not relegated to Jerusalem. The case of the Shaya family house in Jaffa, which I wrote about here last November, is at the heart of Israel’s metropolitan center. It is also happening on a massive scale in Haifa and the north. Kadmon asks what will stop the Palestinians from exploiting this precedent to demand their properties in west Jerusalem. The answer, legally at least, is that Israel’s courts recognize only the Jewish “right of return,” an uncomfortable fact that has not yet been the subject of any substantial constitutional judicial debate. That, however, is only a matter of time. The evicted families of Sheikh Jarrah have deeds to properties in Jaffa and West Jerusalem. They will go to court and work the appeals process all the way up to Supreme Court. Because they are living on the street, the judges it will not have the luxury of dragging a ruling out indefinitely. What will they do, rule that Jews and Palestinians are not equal under the law (the “A” word comes to mind) or create an earthshaking precedent and give the plaintiffs their ’48 properties back? Damned if you do and damned if you don’t. In another time, I would also have added that the Sheikh Jarrah evictions undermine international trust in Israel’s sincerity regarding a two state solution, but I don’t think there is much of that left anyway. It is important to note that judicial precedent gives the Israeli government the full power to step-in and stop the evictions, the issue of property rights notwithstanding. The supreme court has consistently sided with the government when it asserted that the issue is of “diplomatic importance.” There are a number of cases from the period of Rabin government’s “settlement freeze” in the ’90s. Perhaps the most poignant, and directly relevant example is the case of Ikrit and Birim. The residents of these two villages in the Galilee were asked (literally) by the IDF to leave “temporarily” in 1948. They have since lived nearby as internally displaced refugees, while their villages remain empty and the local Kibbutzes farm their land. The Supreme Court recognized their right to return, but ruled that the government’s concern for a dangerous precedent overrode that right. A government genuinely concerned with the ongoing destruction of the two-state paradigm, would have made use of this power in Sheikh Jarrah. Make no mistake: from the beginning of his term Netanyahu has been taking various measures that mean increasing friction with the Palestinians in East Jerusalem, and he’s doing it with the help of Mayor Nir Barkat. Barkat, elected with the massive support of the liberal, secular, not to say leftist public, has started to look like the nightmare of supporters of peace and coexistence. Tel-Aviv: Thousands march for human rights and democracy. Shiekh Jarrah, Jerusalem: Police disperse protest against eviction of Palestinian family by settler group. Ynet, which headlines the protest “violent,” then explains that by “violence” it means refusal to disperse. Twenty-one Israeli citizens arrested. 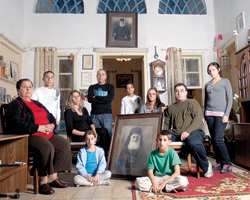 Palestinian family has lived in home since well before 1967. Yasuf, Northern West Bank: Settlers torch mosque, burn books and leave graffiti: PRICE TAG and WE WILL BURN YOU ALL. Palestinian villagers stone IDF, which then shoots at Palestinians. Two Palestinians and one soldier injured. On November 18 I wrote about the State Department report criticizing religious freedom in Israel and the Atlantic’s Jeffery Goldberg’s amazement at the fact Israelis and Jewish-Americans had all but ignored it. I attached an op-ed by Naomi Chazan that ran in that day’s Yediot, which, for the first time in the mainstream Israeli media, addressed the report, slamming Israeli intolerance for Jewish religious pluralism. On November 26, Common Ground News Service ran an article by Prof. Menachem Klein, a political scientist at Bar Ilan University, which approaches the issue from the perspective of Jewish-Muslim relations in the Israeli-Palestinian context. No less important is the question of the return to the land. The Palestinian right of return is denied by Israel offhand. Yet, Israel upholds the principle of Jewish return to the Land of Israel. This is perceived in Israel as an exclusive right. The idea of Jewish return is what motivates the settlements in Hebron and galvanises Jewish groups to change the status quo on the Temple Mount. The wheels of history cannot be reversed, and religion can no longer be separated from the conflict over territorial sovereignty and return. Despite this blog’s title, this post is on something you can read about in Haaretz. I do add some analysis and access to additional materials, but the primary reason for the divergence is emotional. Not only is this a story of extraordinary injustice, it is also about the family of a friend and colleague, Mary Koussa. You can read the entire saga of the Shaya family in this Haaretz article, but the gist is fairly simple. In the 1920’s, Salim Khoury Shaya, head of Jaffa’s once prosperous Greek Orthodox Palestinian community, built a house for his family. He had seven children. In 1948, a census was taken of the remnants of Jaffa’s Palestinian community. Empty houses were taken over by the State of Israel, according to the Absentee Property Law (more about that at the bottom of this post). The Shaya house was a unique case. Three of the siblings were absent (in Lebanon), but four were present. So the State proclaimed itself “partner” and legally took over 40% of the house. Decades passed and, except for a number of failed attempts in the 50’s and 60’s, to sue for full property rights, the Shaya family didn’t hear much from the government. Their area of Jaffa (near Ajami) was a slum no one was really interested in. That all changed about four years ago. The Jaffa coast went through accelerated gentrification and property prices skyrocketed. Amidar, the government owned housing company that administrates most Absentee Properties, saw an opportunity for a windfall. Contrary to popular perception, most of the Palestinians living in the area are not descendants of the pre-1948 residents, but descendants of refugees displaced during the war from other parts of the country, and are now tenants of Amidar. Therefore, their eviction, on a variety of pretexts, was relatively simple. In 2007-2008 alone, Amidar issued at least 400 eviction notices in the Ajami neighborhood. The few Palestinian owners were more of a problem. But in 2007, some bureaucrat looking through old case files discovered the Shaya family’s vulnerability and hatched a plan — slap them with an exorbitant demand for years of back rent for the 40% of the house “owned” by the government and then demand that the “partnership” be dissolved through sale of the house to a third party. The Shayas don’t want to leave their ancestral home, but their attempts to buy out the State were rebuffed, and now Amidar and the Israel Lands Administration (ILA) have taken them to court. They want them out. Even from the perspective of Lieberman’s Jewish-Nationalist school of thought there is much that is wrong with this story. As a devil’s advocate, I would ask his disciples in the government, why persecute “good Arabs?” The Shaya’s are fully integrated in Israeli society. One of the second generation siblings worked at the Tel-Aviv municipality for his entire life. An uncle was the first Palestinian policeman recruited in Jaffa by the Israeli government in 1949. A visitor at the Sunday family gatherings hears a mix of Arabic and Hebrew. Why is Israel taking them back to the Nakba that it wants to force them to forget through legislation? For Israelis who still believe in a two-state solution to the Israeli-Palestinian conflict, and for genuinely “pro-Israel” Jews abroad, this kind of reopening of 1948, which is also happening in Jerusalem and Haifa, is no less than suicidal. It severely undermines the premise of 1967 as the starting point for a diplomatic solution, with its implications regarding the 1948 refugees. For all Jews, or at least those that see Judaism as a culture and a moral code, rather than an ethnic filter, the story of the persecution of the Shaya family presents a grave injustice for which we, as a collective, are responsible. It often seems to me that the apparatus of our government has lost any sense of justice and morality. Indeed it took a Palestinian citizen of Israel, the family’s lawyer, Adv. Hicham Chabaita of Tel-Aviv University’s Human Rights Clinic, to point out the immorality of suit. Right above is an excerpt from Samuel II, chapter 12, verses 1-4. Here it is, English translation alongside Hebrew original. Chabaita also reminds the court that the Israeli Supreme Court described the Absentee Property Law as “meant to fill a temporary role: to preserve absentee properties lest they become abandoned and open to looting.” He also dug up the protocols of the Knesset debate around the enactment of the law and quotes the Members of the First Knesset, keenly aware of the circumstances of their own people, so recently displaced and dispossessed, describing its purpose in the same way. The Tel-Aviv Magistrate will hear the case in January.